Rasmus Ristolainen scored off a deke around Brent Burns, and Nathan Beaulieu also scored for Buffalo, which hasn’t lost since Nov. 4. The streak matches the longest in Sabres history and is the NHL’s best run since the Columbus Blue Jackets won 16 in a row from Nov. 29, 2016, to Jan. 3, 2017. Buffalo won 10 straight twice before, and most recently by going 10-0 to open the 2006-07 season. 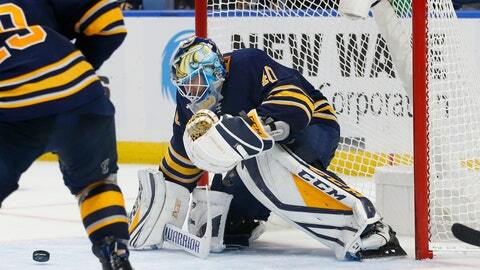 Carter Hutton stopped the first 32 shots he faced and 36 overall to extend his personal-best winning streak to eight, during which he’s allowed just 15 goals. Joe Pavelski scored twice for the Sharks in the final 8½ minutes to up his team-leading total to 15. PHILADELPHIA (AP) — Brady Tkachuk scored twice in the third period and Matt Duchene scored the eventual winner with 2:59 left, lifting Ottawa past Philadelphia, in the Flyers‘ first game since they fired general manager Ron Hextall. Jake Voracek, Radko Gudas and Travis Konecny scored for the Flyers, who coughed up a 3-1 lead over the final 6½ minutes and lost for the sixth time in seven games. TAMPA, Fla. (AP) — Ryan Miller made 34 saves and Nick Ritchie had a goal and an assist for Anaheim. MONTREAL (AP) — Curtis McElhinney stopped 48 shots and Carolina defeated the Canadiens in Shea Weber’s return from injury for Montreal. CHICAGO (AP) — Cody Eakin and Shea Theodore each had two goals and an assist, and Vegas picked up its season-high fourth consecutive victory. NASHVILLE, Tenn. (AP) — Nathan MacKinnon scored twice and Semyon Varlamov made 36 saves for streaking Colorado. WINNIPEG, Manitoba (AP) — Zach Aston-Reese scored the tiebreaking goal with 5:12 remaining off a perfect pass from Phil Kessel, and Pittsburgh rallied past Winnipeg. Derek Grant’s first of the season pulled the Penguins even 5:08 into the third period. Sidney Crosby and Riley Sheahan also scored for Pittsburgh (10-8-5). ST. PAUL, Minn. (AP) — Josh Archibald had two goals and an assist, and Arizona rallied from a two-goal, third-period deficit for the win. Devyn Dubnyk, who missed Minnesota’s last game with a stomach bug, stopped 10 of 14 shots. Antti Raanta stopped 17 of 20 shots before leaving with a lower-body injury after two periods. Adin Hill stopped all five Minnesota shots in the third period. EDMONTON, Alberta (AP) — Oscar Klefbom scored his first goal of the season in overtime, leading Edmonton in coach Ken Hitchcock’s home debut with the Oilers. VANCOUVER, British Columbia (AP) — Dustin Brown scored 53 seconds into overtime, giving Los Angeles a victory over Vancouver.